EU3-1824CS 18" x 24" utility cart with solid shelf, 4" caster diameter. EU3-1830CS 18" x 30" utility cart with solid shelf, 4" caster diameter. EU3-1836CS 18" x 36" utility cart with solid shelf, 4" caster diameter. 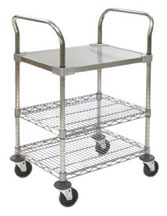 U3-2136CS 21" x 36" utility cart with solid shelf, 5" caster diameter. U3-2436CS 24" x 36" utility cart with solid shelf, 5" caster diameter.